The Making of Moomin Costume Party - Spinfy - quality content for kids with smart parents! The idea about Moomin Costume Party came from Riina and Sami Kaarla, an adorable author couple who have written and illustrated several children's books, including the newer Moomin books for toddlers. 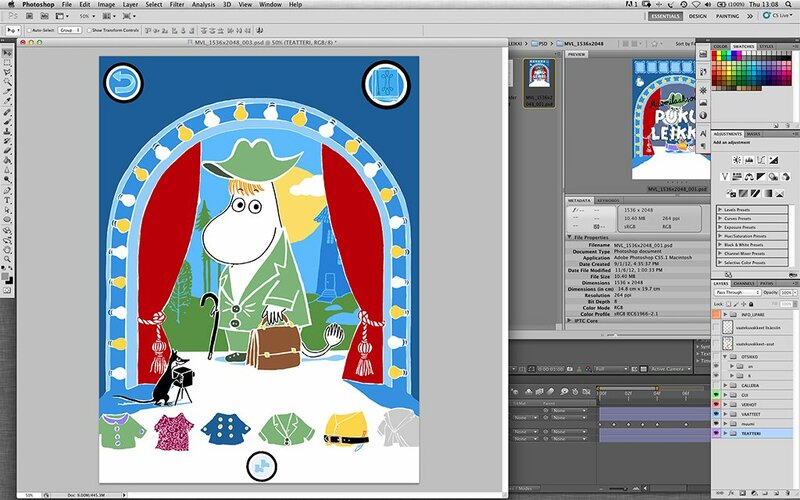 After developing the interactive Moomin and the Lost Belongings storybook together with us, both Spinfy and the Kaarla couple thought it was time for a different kind of kids app with more gamification and interactivity. It was important to keep the app simple, without any text, for it to be globally applicable on its initial release. Spinfy met Riina and Sami Kaarla and WSOY to discuss the details of the app. At this early stage it was important to be as clear as possible about what features and interactions the app would contain. Many ideas were abandoned or categorized as ”nice-to-have in the future updates”. The work started in the end of September and the deadline was set to early December, so limitations were necessary in order to reach a realistic plan and schedule. I think that in all creative projects everybody has big ideas and a vision on how the end-result should work and look like. However, you still need to keep your feet firmly on the ground and you might need to ”kill your darlings” in order to keep the goal realistic. When the plan was ready, Riina and Sami Kaarla drew the illustrations for the app. In this case, the characters (Moomintroll and Snork Maiden), backgrounds, and all the different costumes. Kaarlas draw and digitalized them as separate objects, making the job easier for our Graphic Designer. Once the Kaarlas were done with all the illustrations Pirkka took over the job in our end. He’s one of our Graphic Designers and we are proud to say that he recently won the Graphic Designer of the Year title in a Finnish game magazine! He magically transformed the graphics into suitable format for programming. I personally don't know much about the technical aspects of this process, so to me it looks pretty much like this. Now guess what happened after this. I'll tell you that next week.